Mayor Mark Boughton said there was no attempt by anyone to hide the details of the spores in the car trunk. "It’s outrageous that anyone would allege anything different,’’ Boughton said in response to TV and blog reports. Interesting to note how days after FOX-61 questioned officials about the car, and no one could address the reporters concerns, that those SAME OFFICIALS (days later) SUDDENLY have all the answers. I'll touch back on this subject later. BREAKING NEWS: Face of hatred pleads "not guilty"
Man, what a busy day. In court today, the new anti-immigrant posterboy for stupidity, John Casamento plead "not guilty" to the charge of 6th degree larceny. This act of ignorance stemmed from the dummy running around like a moron at two o'clock in the morning stealing several Brazilian flag raising lawn signs. It's believed that this is the same idiot that repeatedly desecrated the signs over a series of days. This story is still developing and I haven't even rolled out any of the information I have in this dope. This is a major development that was sparked by the FOX-61 story on Wednesday, which I posted on this site earlier today. Health officials also acknowledged for the first time Friday that a car used to transport the goat hides that were the source of the anthrax also had some spores in its trunk. Here's the report from WTNH. From the News-Times website, you can also watch the moment when Mike Nalipinski of the U.S. Environmental Protection Agency finally admitted what FOX-61 reported on Wednesday...that the car WAS contaminated. Also, watch as he avoid explaining how the car made it's way off the property (days after the people were infected with the anthrax) in the first place. Unfortunately, ONCE AGAIN the News-Times DROPPED THE BALL and didn't ask the obvious series of questions raised by the FOX-61 report and giving Mayor Boughton and Nalipinski a pass, with the EPA official nonchalantly commenting about cleaning the car out as if he was NEVER asked about how the car (used to transport the drums) made it's way off the property to the dealership in the first place (something FOX-61 question him about on Wednesday). Based on the FOX-61 report, if the local and state police secured the area, how did someone drive the car, which was used to transport the drums CONTAMINATED WITH ANTHRAX, from the contaminated house on Padanaram Road, to the dealership on Federal Road days after two people became ill from exposure to the spores? What happened to the man at the dealership who developed a "rash" after handling the car? If he tested for anthrax exposure, why wasn't the public informed? Who else came into contact with the car? Was the car on the "for sale" lot and if so, does anyone know if any potential buyers check out the car between the time the car was brought to the dealership and when it was brought back to the house? REMEMBER, we're talking about a 2006 Hyundai so it's quite possible that, if on the sales lot, several people could have came into contact with the vehicle. If the car is STILL contaminated, why did a local tow truck operator, who had NO EXPERIENCE IN DEALING WITH ANTHRAX bring it back to the house? Why didn't local, state, and federal officials THAT NOW HAVE PADANARAM ROAD BLOCKED OFF WHILE THEY CLEAN UP THE SCENE, pick up the car? 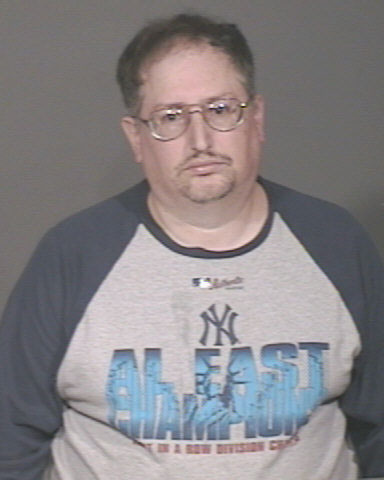 Has tow truck operator Tony Alves been tested for anthrax exposure? If the car wasn't contaminated, why was it brought back to the house? 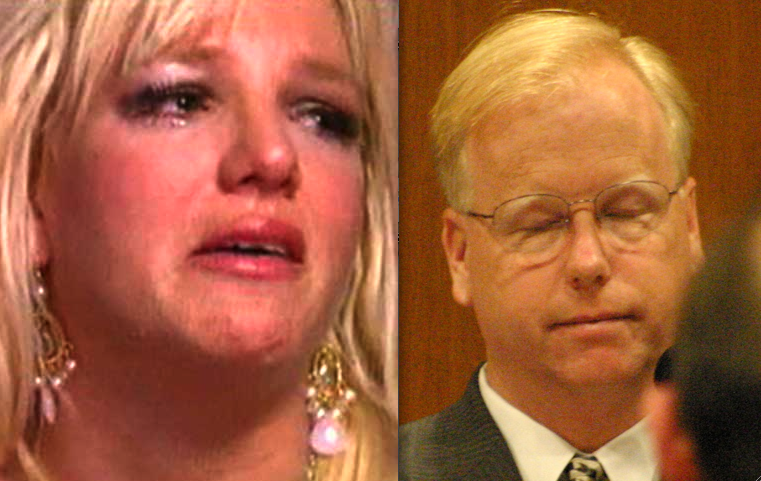 Why hasn't Mayor Mark Boughton addressed the mishap with the public? According to the FOX-61 report, the car was driven to the dealership DAYS after the people infected with anthrax. If that is the case, we're talking weeks since this incident occurred. If that’s the case, then why hasn’t the police chief, health officials, and mayor addressed the media and why hasn't anyone taken responsibility for their role in the screw-up? Why did it take a television station based in Hartford, and with no establishment in Danbury, to break this story? How could the News-Times overlook such a serious screw-up by local, state, and federal officials (as of today, the News-Times has still not addressed the case or questioned the Mayor who is well aware of the mishap). Instead, the only thing the public has read in regards to the entire anthrax incident is HOW WELL City Hall has informed the public of the situation, which is also somewhat debatable. If it wasn't for FOX-61, would this mishap ever been reported to the public? WHY WAS THE PUBLIC NOT INFORMED ABOUT THE CAR AT THE DEALERSHIP?!? WHY WASN'T THE CITY'S REVERSE PHONE SERVICE USED TO INFORM THE PUBLIC OF THE SERIOUS SITUATION REAGRDING THE CAR AT THE DEALERSHIP?!? WHY HASN'T MAYOR BOUGHTON MADE A STATEMENT ABOUT THE MISHAP!?! AGAIN, THE CAR WAS DRIVEN TO THE DEALERSHIP DAYS AFTER PEOPLE BECAME SICK FROM ANTHRAX EXPOSURE. AS FOX-61 STATED, WHY WON'T ANYONE EXPLAIN HOW THAT CAR ENDED UP IN THAT DEALERSHIP PARKING LOT? WHY WON'T ANYONE TALK ABOUT THIS SCREW-UP AND TAKE RESPONSIBILITY? Again, here's the report from Wednesday night's FOX-61 news broadcast. PLEASE take note of Mike Nalipinski running away from the questions posed to him by the reporter about how the car make it's way off the property to a CAR DEALERSHIP. Hopefully, FOX-61 will do a follow-up to their story as it seems like NO ONE ELSE (including the local media) can ask the tough questions from those who are suppose to make sure the public is safe. Hopefully, they can also verify that the person at the dealership who received a rash in fact did not come into contact with the anthrax that was found in the trunk. Also, hopefully, they can look into whether or not, the person who towed the car back to the home was tested for the disease. BTW: Is this another example of "People over Politcs?" Is videotaping the mayor's "greatest hits" part of a chief of staff's job? I guess this is another example of the taxpayer's money being well spent. What happened Mike, was Ted sick today? UPDATE 3:35 P.M.: Post was updated to fix grammatical errors and correctly site sources of the information. UPDATE 2 3:40 P.M.: I just confirmed that the reader who was informed about the car screw-up from a police officer learned about this matter approximately a WEEK AGO. Story is STILL DEVELOPING. At this point, you have to wonder if the mayor is passing out his re-election campaign material while making statements like this. To help these businesses, Mayor Mark Boughton said Thursday the city is investigating whether the road can be declared a disaster area. That way, he said, the businesses could recoup their losses through the Federal Emergency Management Agency or the Small Business Administration. Yeah, and the mayor has a bridge in Brooklyn he'd like to sell you. Like I said before, this isn't 2005 and not all the residents in the area are buying Boughton's "Rovian-flavored" Kool-Aid. In fact many are getting a bit pissed off. "Do you think that's going to happen?" Jabara said. "I'm not holding my breath. This whole thing is a waste of time." I couldn't agree more. Closing down the street DURING the day makes absolutely no common sense when you could effect less people (and businesses) by closing the road during the night. Learn more about Cutaneous Anthrax, watch the FOX-61 report, and maybe you'll become just as pissed as some of those who are living through this nightmare in the 2nd ward. Brian Farrell, manager of the Halas Farm Stand, said the stand's business was hurting badly. Farrell said rather than opening the road at night and closing it during the day, the crews should be working at night and letting people pass during business hours. "I'm all for a cleanup," he said. "But there's got to be a better way than this." Is there a cover-up happening in the anthrax case? ON WEDNESDAY NIGHT, FOX-61 shocked the state with an exclusive report that questions the competence of everyone involved in the anthrax case. The shocking report is yet another indictment on the Danbury News-Times, which once again drops the ball and fails to do any type of serious reporting. I'll let the video tell the disturbing details. Why hasn't Mayor Mark Boughton addressed the mishap with the public? 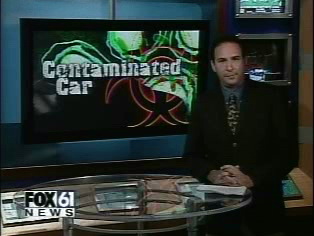 According to the FOX-61 report, the car was driven to the dealership DAYS after the people infected with anthrax. If that is the case, we're talking weeks since this incident occurred. If that's the case, then why hasn't the police chief, health officials, and mayor addressed the media and why hasn't anyone taken responsibility for their role in the screw-up? A reader who lives off of Padanaram Road near the house that's contaminated was told about the screw-up from a police officer on the scene. Why is it that a person can learn about this MAJOR and potential DANGEROUS screw-up from a police officer but NOT from the police chief, health officials, the feds (all of whom who are currently blocking Padanaram Road while cleaning up the contaminated scene). ...and of course, where's the leadership from the top elected official in Danbury. What happened to PEOPLE OVER POLITICS...what happened to PROGRESS OVER POLITICS? UPDATE: 3:37 P.M.: Post updated for grammatical purposes and to give proper credit to cited sources. 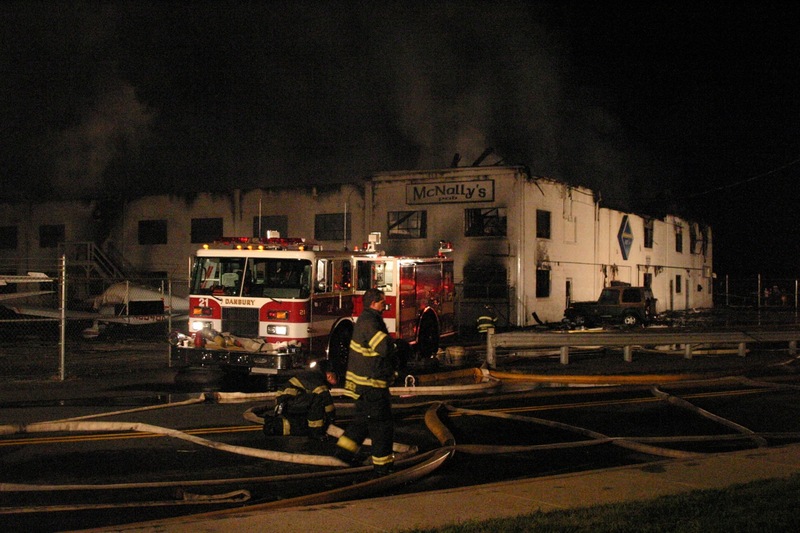 Fire completely destroyed building that housed McNally's Pub, and Reliant Air. 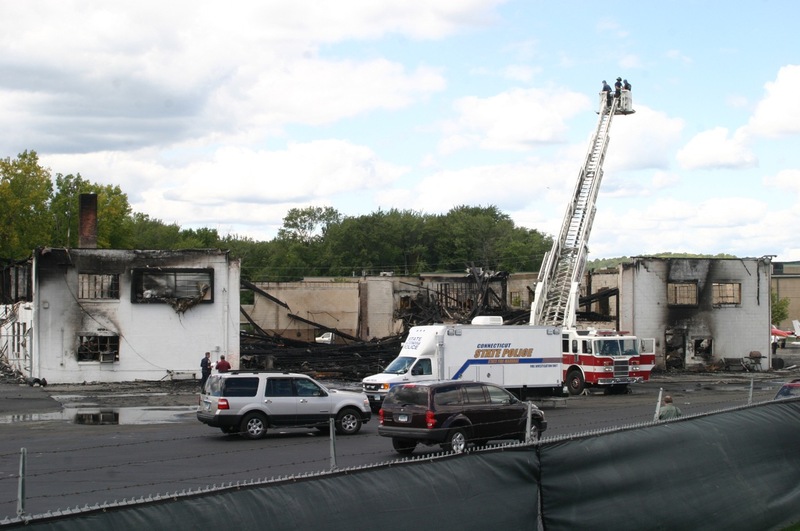 I found out about the fire at Danbury Airport around 11:20 and ran down to the scene. FOX-61, NEWS-12, WVIT and WTNH were on the scene as well the print media including the News-Times, which got a jump on everyone since they have a police-fire scanner. I'm rather tired right now because I didn't leave until well after 1:00 A.M. and I have a great deal of video from the fire to process. I'll update this site with images and video from the fire soon. UPDATE: Wow, what a night. I thought the library fire was bad but this is by far on the ugliest fires I've ever seen in Danbury. Hats off to all the residents of Danbury who catch video and photos of the fire. I've seen some amazing photos and video from people who were on the scene (McNally's had a decent crowd that night and people caught pictures on their cell phones). Unfortunately, I found out about the blaze late in the evening and by the time I arrived on the scene, most of the fire was extinguished (thank goodness). The silver lining in arriving late was that I was able to get some close-up shots of the building and video tape the firefighters in action. Also a round of thanks goes out to those guys in uniform who came up to me and say "hey, you're that guy with the blog." I really appreciated that they didn't give me any problems and pointed to the best place to film the footage while staying out of their way. Big thumbs up goes the guys who took care of the on-lookers who were dangerously darting in the street. I owe you round the next time I see ya. NOTE: The following video is formatted high-resolution and surround sound stereo. Although you can watch it on this webpage, it's really designed for full screen. For the full experience, just click the rectangle on the lower part of the video window and enjoy the show. You can watch my photo slide show of the scene by clicking here. The News-Times did an excellent job with their coverage of the blaze. Obviously, there is no information regarding the origin of the blaze because of all the fuels and stuff involved but the state examiners are on the scene and I'm sure we'll learn more about what happened in the coming days. The newspaper also did a smart thing collecting footage from readers and I encourage you to take a look at their user-submitted photos and videos. You can also read/watch the report from WTNH by clicking here. UPDATE 7:00 p.m.: It seems like the Danbury News-Times photographer Carol Kaliff caught the photo of the night (if not the year). Her photo from the fire is on the AP wire and was picked up by the Hartford Courant in their article on the blaze. I'm sure the photo will be used elsewhere so I'll keep an eye out and see who else picks it up. UPDATE: Post bumped to top with additional video. Congressman Chris Murphy briefs the media about his meeting small business owners and their concerns. JK's Restaurant, 09.10.07. 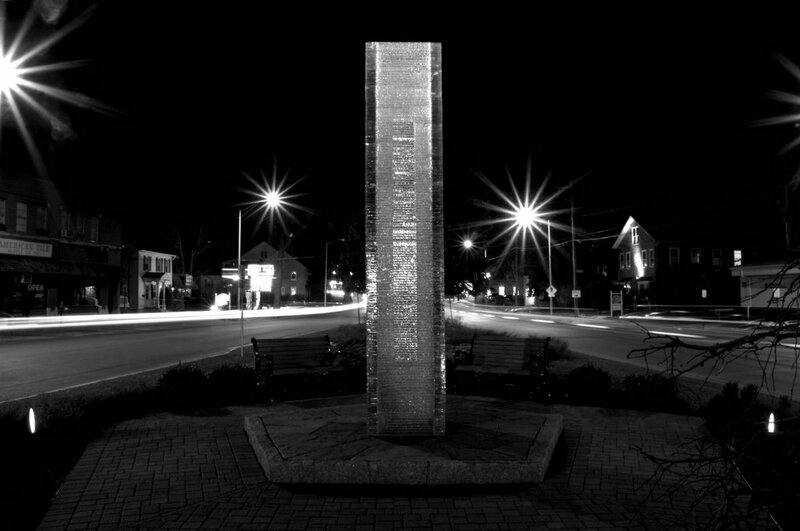 Photo by ctblogger. On Monday, Congressman Chris Murphy made a trip to his second home Danbury and met with the members of The Greater Danbury Chamber of Commerce. As he met with the small business owners at his favorite restaurant, Murphy listened to their concerns and talk about his realistic approach to bring tax relief plan for small businesses. After the meeting, Congressman Murphy held a press conference outside JKs and talk about his conversation with the business leaders, which largely centered around the sub-prime crisis and the "chilling" effect it will have on the housing market. This market, really created by the instability of the housing market, is really one of the scariest that we've seen in a long time and both the Federal Reserve and Congress are going to have to take some steps to try to shore up the housing market, which is potentially crumbling at our feet in many places. Connecticut is not as bad off as other parts of the country, in terms of the number of foreclosures and sub-prime loans that we've seen, but the entire economy is threatened by the large number of foreclosures and credit squeeze that we're seeing." • The congressman's comprehensive tax relief package for small businesses, which includes expanding the research and development tax credit, an energy tax credit that helps small businesses deal with increases in energy costs, and addressing the alternative minimum tax for families making 75,000 to 100,000 who are forced to deal with the extra financial burden. • His thoughts on immigration and his disapproval over the slow pace of Congress addressing the issue. • The lack of affordable housing in the area. • Thoughts on dealing with traffic congestion on I-84. After the meeting, Congressman Murphy's staff released this press release, which gave more details about his plan. 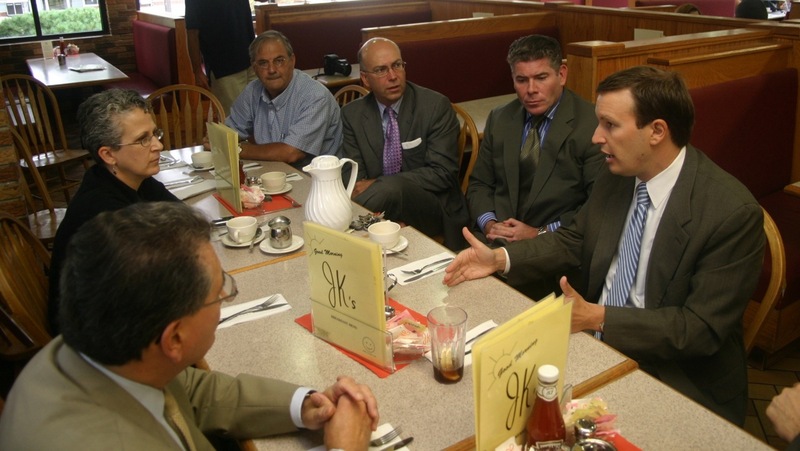 Congressman Chris Murphy (CT-5) came to JK’s Diner in Danbury to announce that this month he will be introducing legislation to provide additional tax relief to small businesses. Since taking office in January, Murphy has been working to cut taxes - earlier this year, the House of Representatives passed and the President signed several small business tax cuts that Murphy supported. Prior to the press conference, Murphy held a roundtable discussion with members of the Danbury Chamber of Commerce and community residents to ask for their input on several provisions that could be in the Murphy small business tax cut plan. “When I meet with business leaders across the Fifth District, I hear the same thing over and over again – the cost of doing business in Connecticut is too high. Federal tax policy changes could help alleviate some of the pressure these small businesses feel, and I want to help them succeed. I came to Danbury today to listen to what people here need in order to keep the economy of the greater Danbury area on track,” said Murphy. This month, Murphy plans to craft his own small business tax cut package that could include provisions to allow deductions for state and local general sales taxes, expand the research and development tax credit, extend the new markets tax credit, increase access to capital for entrepreneurs, and simplify tax filing for small businesses. “Congress isn’t finished cleaning up the mess left in previous years when it comes to our tax priorities. Small businesses deserve a better deal than what they are getting now, and I hope to craft a tax cut plan that helps businesses across the Fifth District,” said Murphy. This year, Murphy has already supported a $4.84 billion small business tax relief plan. The package was approved by the House and Senate and signed into law by President Bush as part of the Iraq Supplemental Appropriations bill. · Extended Section 179 Small Business Expensing, which will let small business owners buy and write off more equipment each year for use in their trade or business. · Ensured married couples who jointly own a small business both receive credit for paying Social Security and Medicare taxes. · Included an enhanced tip credit to ensure employers don’t lose current tax benefits when the minimum wage goes up. · Contained “S-corp” provisions to ensure small businesses keep the tax benefits of being a small business, even as they grow and expand. · Provided tax incentives to help businesses rebuild and supports construction of low-income housing in areas hit by Hurricanes Katrina, Rita, and Wilma. · Extended the Work Opportunity Tax Credit (WOTC) through August of 2011. The WOTC supports businesses who hire economically disadvantaged workers such as disabled veterans. “I was proud to support these tax breaks, but I see this victory as only the beginning. That is why I am working on a tax plan to do more for small businesses so that they can stay in business and grow,” said Murphy. The News-Times and WLAD were also on the scene and according to all reports, the business leaders were very impressed by what they heard from the freshman Congressman. Murphy said Congress recently passed a small business tax relief package that, among other things, allows businesses to write off more equipment purchases. The lawmaker is planning to submit his own bill soon that would allow deductions for sales tax, expand research and development tax credits, and simplify the tax filing paperwork process for small businesses. "Just standardizing some of the forms would cut down on a lot of paperwork for us and save us money," said Jane Didona, a landscape architect who was among several business leaders who met with Murphy at JK's Restaurant on Monday. "I was very impressed with Murphy's approach to the issue. Instead of tackling the entire problem, he is looking at pieces to the problem that can be addressed." Harry Carey, chairman of the Greater Danbury Chamber of Commerce, thanked Murphy for meeting with him and other members of the organization to hear their concerns. "I took away a realistic sense that many of these are huge issues," he said. "Murphy is wise in breaking them down and handling one piece at a time rather than a tidal wave of change." Overall, the meeting was very informative and gave an insight into Murphy's plans as Congress comes back from it's August recess and from all indications, the members of the chamber were appreciated Congressman Murphy taking time to listen to their concerns. From Monday, here's video footage of Murphy's presser. 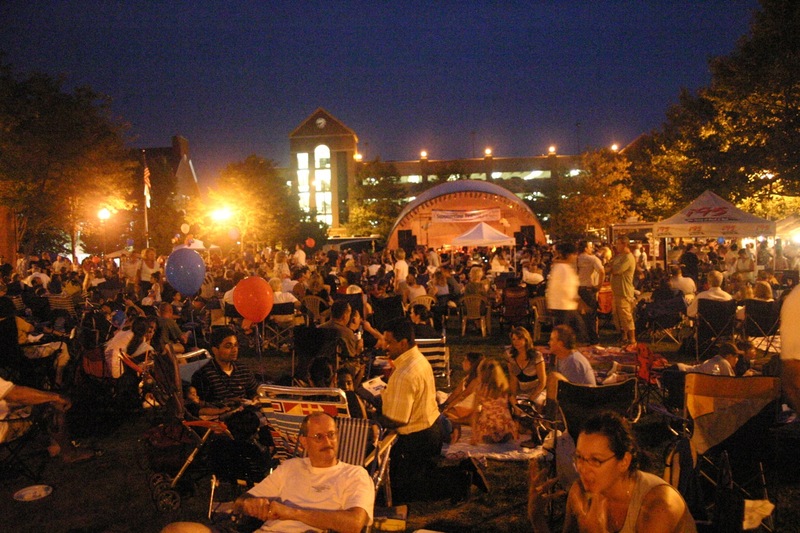 The silence from the audience when Mark Boughton was introduced at the Taste of Danbury? ...so much for that so-called "warm" reception. Okay, okay, okay, I'm sorry. We're behind schedule here and I need to pick up the pace with the posts. Processing videos really takes a great deal of time and too many stories have been placed on the backburner. I really can't believe the number of people contacting me with tips and suggestions on things happening in the area that are not being reported. It getting to the point where a number of individuals have suggested to me that there needs to be a weekly paper in Danbury that focuses on local issues. There are many things happening RIGHT NOW under the radar of most residents; unfortunately, the HatCityBLOG staff don't have the manpower to cover every issue the way it should be covered. 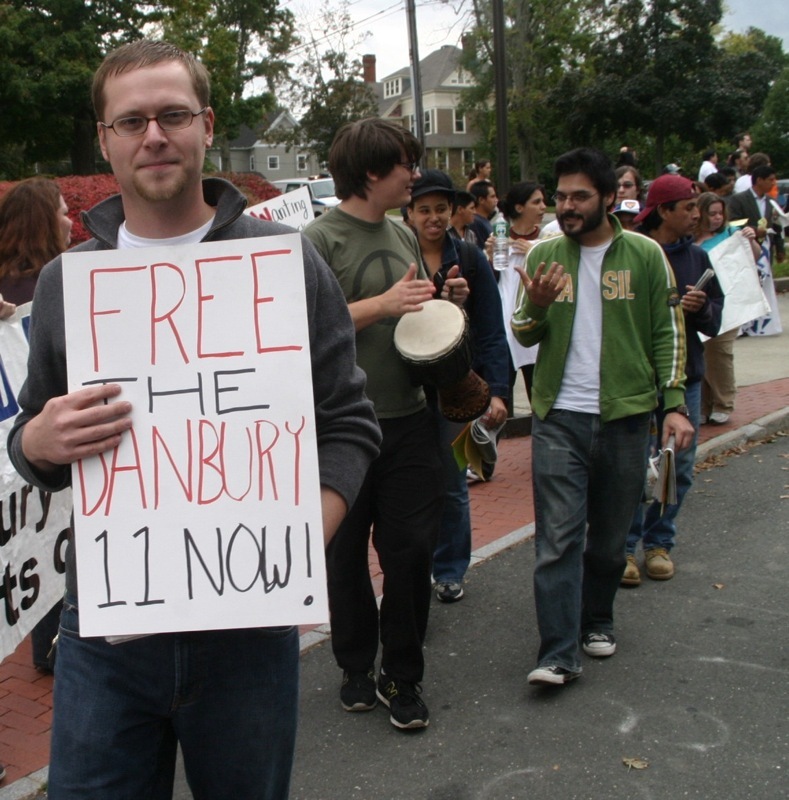 In short, I've come a long way since the start of this site in 2005, but I'm still far away from my ultimate goal of providing COMPLETE coverage of every local issue in the Danbury area. Since the News-Times is REALLY dropping the ball in terms of addressing local issues left and right, and WLAD has shrunk their news staff to unacceptable levels, the prospect for a weekly newspaper (or newsletter) in the area is realistic and I'm going to talk to contacts I have in the mainstream media, and those who tried to run a weekly paper in Danbury in the past about how best to go about establishing a new weekly in Danbury. Of course this will cost money (or investing in a start-up company) and there is always a risk in going down that road but I am encouraged by the steady increase of traffic and the amount of responses that flood my inbox. Well, enough of that, the whole weekly idea is still in the concept stage and won't happen until sometime next year. Until then, I should get back to posting. I just wanted to take a small moment to apologize for the slow pace of the posts and a BIG THANK YOU for the crazy amount of feedback I'm receiving around the city. The new poll you guys requested is up and ready. You're doing a heck of a job Mark making sure the house is in order. The federal Environmental Protection Agency is fining the city of Danbury $3,650 for failure to update the risk management plan for its West Lake reservoir water treatment plant. David Deegan, spokesman for the EPA’s New England office in Boston, said Monday the fine was the largest of the eight the EPA levied for failure to file a risk management plan. Deegan said such plans are important because they let the city and the region know how to react if there should be an emergency incident at the water treatment plant. The plant stores and uses chlorine gas — a highly caustic gas used to purify water. "This isn’t just a piece of paper,’’ Deegan said. Antonia Iadarola, the city’s superintendent of public works, said the city believes Veolia Water of North America — the Texas-based management company that has run the plant since 1997 — has the responsibility of updating the risk management plan. Iadarola said the city may ask the company to pay the fine. Ah, what? The company should pay the fine? Isn't it the city's responsibility to make sure that the company you hired to do the job isn't SCREWING UP? Since this isn't the first time Danbury was slapped with this type of fine (the first being in Oct 2001), you'd think that the city would have their act together and the top dog at City Hall would have a handle on things. Oh I get it, he'll just find some way to blame this on Gene...how silly of me. Hat tip to you know who for passing along this info so quickly. I love my readers! 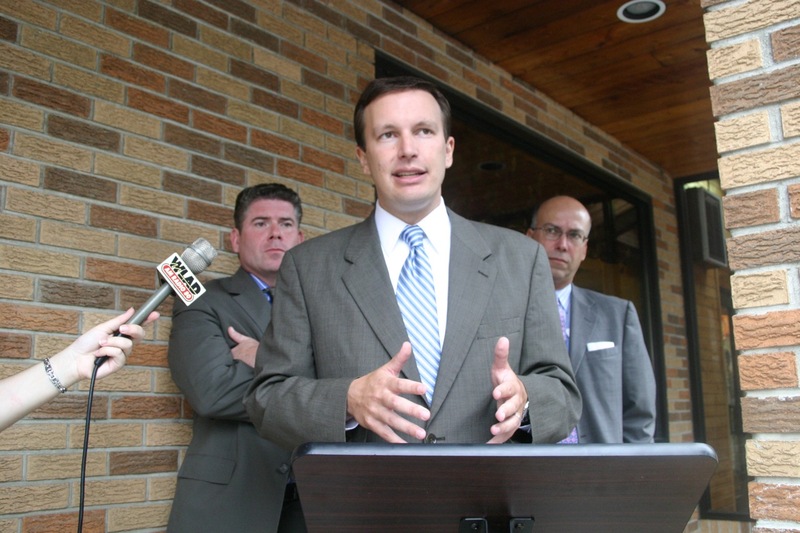 Congressman Chris Murphy meet with small business owners. JKs Restaurant, 09.10.07. I'm beginning to think that JK's is Congressman Chris Murphy's 5th District Headquarters. I have to take off to a meeting but I'll file my report and explain why Congressman Murphy was in Danbury meeting with members of The Greater Danbury Chamber of Commerce. The Republican Party know who this person is (which is why they're silent right now). The members of the Lion's Club know who he is. The Danbury News-Times knew who he was before they did their B.S. article on him. The Tribuna DEFINITELY know who he is. I'm going to make the connection between this xenophobic idiot, Mark Boughton, the anti-immigrants who shield their real intentions from the public, and the Republican Party as well as explain why the News-Times is the worse newspaper in Connecticut VERY VERY SOON. This is the moment at the Taste of Danbury when the I-95 crew introduced Mayor Mark Boughton and his wife to the audience. The problem...you could hear a mosquito fly in the air when his name was introduced. So many Boughton balloons and not one clap, not one cheer for the three-term mayor. It's just about as pathetic as his laughable fundraiser at Molly Darcy's earlier this week. I'll bring you more from the Taste of Danbury later. NOTE to readers: Several of you guys emailed me asking if I caught the "Boughton" moment on video. Unfortunately, I didn't have my video camera in my hand at that moment and I was trying to adjust no SLR camera for the low-light conditions at the moment they introduced the mayor. The photo is the only thing I have as a record of the moment for right now. Hopefully, someone else has it on video and will send me a copy. If anyone has video of Boughton's flop, please email me ASAP. Helena Abrantes releases new radio ad: "Danbury Can Do Better"
On Friday, Democratic Mayoral candidate Helena Abrantes launched a new radio ad entitled "Danbury can do better" that receiving a great deal of positive feedback from those I talked to at the Taste of Danbury who heard the ad on WLAD. Outlining her political and business resume, Abrantes presented her vision for Danbury, which centers around "returning vision, hope, respect, and results for Danbury." Running on the theme of improving the quality of life in the area, in the ad, Abrantes outlines a number of her goal if elected mayor, which includes getting a handle on irresponsible development, addressing traffic concerns including road improvements, reduce rising water and sewer rates while controlling property taxes, and investing more manpower to the police force. Abrantes also gives a preview of goal views for the environment by announcing the establishing a "Danbury goes green" initiative as well as a realistic open space program. You can listen to the new radio ad below.